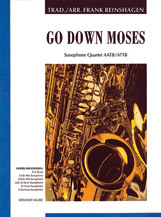 Go Down Moses arranged by Frank Reinshagen has a gospel-swing style. Compatible with the editions for clarinet and brass. Arranged for saxophone quartet (AATB/ATTB).